When you take a look at your current friendships, can you imagine having the same friends around for 90 years? 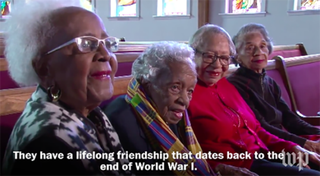 In the epitome of squad goals, four women from Southwest Washington, D.C., formed a friendship over 90 years ago, and it’s still going strong. This summer Leona Barnes, Gladys Butler, Ruth Hammett and Bernice Underwood plan to celebrate their 100th birthdays together. “We all are grateful, and we thank the Lord for all of us to see 99,” Barnes said. In an interview with the Washington Post, the ladies reminisced about their friendship and how they’ve stayed connected to one another and their community in D.C. The ladies definitely let readers know that it wasn’t all laughs growing up together. They fought. Their children fought. Their grandchildren did, too. But throughout the years, their bond has remained intact.